Right bony labyrinth: 1 - front semicircular canal; 2 ampoule; 3 - threshold; 4-6 - the upper, middle and primary curls snails; 7 - round box; 8 - oval window; 9 - sagittal channel; 10 - horizontal channel. The inner ear is a special system of canals and located in them the receptor apparatus of the auditory and vestibular analyzers. There is inner ear in the pyramid of the temporal bone; divided into bony labyrinth and webbed. 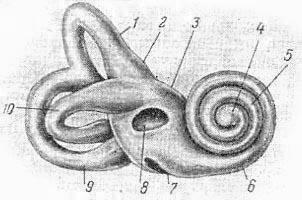 In the bony labyrinth of the inner ear there are a vestibule, three semicircular canal and the snail (Fig). Inside the bony labyrinth of the inner ear are webbed, filled with endolymph. The space between the bone and the membranous labyrinth filled with perilymph. The run-up forms a Central part, backwards and up it goes in the semicircular canals, and anteriorly and medially - a snail. Ahead there are two sacs (saccnlus and utriculus). The bags are otolith devices. Semicircular channels (three of them) are located in three mutually perpendicular planes. Each channel has one extended leg (ampoule) and other easy or smooth. At the bottom of each webbed ampoules has scallop (crista ampullaris) - end of the nervous system. This system (the otoliths, and ampullary apparatus) is called the vestibular apparatus. Snail is a bone canal extending from the vestibule, and forming a two and a half curl around bone rod. Within the bone channel there are three steps: stairs, arches and drum stair, filled with perilymph, and located between them cochlear turn, filled with endolymph. On its lower wall (main membrane) is the organ of Corti - receptor apparatus of the auditory analyzer. The organ of Corti consists of so-called Kartavykh arcs formed by cells-columns, supporting cells of Daters and hair, or sensory cells. In the form of a canopy organ of Corti is covered with a special membrane (reinerova the eardrum). Feeling the hair cells kortieva body entwined branches of the auditory nerve, which are assembled into a spiral node, and then as part of the auditory nerve go in the cerebral cortex. The snail and a prisoner in her receptor apparatus of the auditory analyzer are called cochlear apparatus. 1 - membrana vestibularis (Reissneri); 2 - membrana tectoria; 3 - ductus cochlearis; 4 - stria vascularis; 5 - cellulae Deitersi; 6 - lamina basilaris; 7 - cellula pilaris ext. ; 8 - cellula pilaris int. 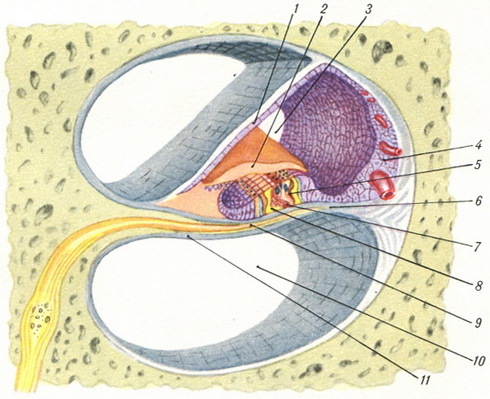 ; 9 - n. cochlearis; 10 - scala tympani; 11 - lamina spiralis secundaria. The physical basis of auditory stimulation are fluctuations in the environment. Movement of the stapes in the oval window osseous labyrinth called wave-like fluctuations of perilymph in anticipation that are passed to the main flying membrane, the cochlea and located on her organ of Corti. The energy of the vibrations is transformed into a physiological process of nervous excitement, which is held to auditory cortical centers in the temporal lobes of the brain where nerve stimulation turns into a sense of sound. The orientation of our body in space, maintaining the balance at rest and with movement are carried out mainly receptors of vestibular apparatus (the otoliths, and ampullary apparatus). Their irritants are straight and angular acceleration, and otoliths changes in body position in space. One of the unconditioned reflexes observed at the irritation of the semicircular canal, is nystagmus (see). In the study of the inner ear function snails and vestibular apparatus examine separately (see Audiometry). The abnormality of the inner ear is associated with inflammatory diseases (see Labyrinthitis) and degenerative-atrophic processes. Degenerative-atrophic changes of the inner ear are developing in a result of infection, intoxication, disorders of metabolism and blood circulation. Degeneration receptor apparatus snails leads to slowly progressive and permanent loss of hearing. Of great importance in the development of degenerative processes of the inner ear are occupational hazards -noise, vibration, sharp fluctuations of atmospheric pressure, intoxication. Key measures - reconstruction of technological processes, individual prevention in production.